MUFF WIGGLER :: View topic - moog ladder filter mods? there are a few ladder filter modules out now that dont have this problem at all so my guess is it can be easily fixed. also 1/2 pole outputs and maybe bandpass out would be sweet. does anybody here have a deep understanding of the minimoog transistor ladder filter and can you explain? my understanding of circuits is extremely limited but i can solder. my model d is an exact copy of the minimoog circuit afaik. im in the process of modding it with a breakout box so i could add filter functions no problem. - insert the unfilterd signal somewhere "strategically" into the filter circuit. where? - "sending the cv from resonance position to vca, or pre filter mixer. so as you raise the resonance you de facto raise the total output level." this of course can create an overdriven vca. - mix a sine wave of the fundamental with the filtered signal. the mini doesnt have sine but tri which is almost the same. thats a simple solution for sure but i have to deal with 3 oscillators..
a bandpass would be subtracting the LP from the HP signal? now, where would i find 1/2/3 pole signals? It's the Arp 4072 filter, not the moog ladder filter, but I'm sure the principles behind both are similar. After all, they both exhibit the same problem. The dual gang pot in the upper right is there to compensate for the low-frequency gain loss. There's an explanation below the schematic on the page regarding how it works. the 303 used a similar trick, but with a single gang pot. it took a signal from the wiper of the resonance pot and fed it to the output. as resonance goes up, so does this signal (which is identical to the filter output), and therefore total output increases. its not a completely flat response, but is simple. yes, all feedback based resonance filters have that "problem", even 2 pole state variable filters. the venerable sh-101 also but it still makes awesome basslines. its easy to understand, if you increase the amplitude of a certain frequency the other frequencies have to come down or the signal ceiling has to go up. most designers include some compensation but bob never did. right now i just adjust the output volume as i increase the resonance - or i add bass with the analog mixer eq which is even better. the arp filter is one of my favourite filters and sounds great even at high resonances. im not quite sure i understand the schematics. so there are two ganged pots, and as the resonance goes up something is added to what? just increase the volume of the signal, what im doing now manually? 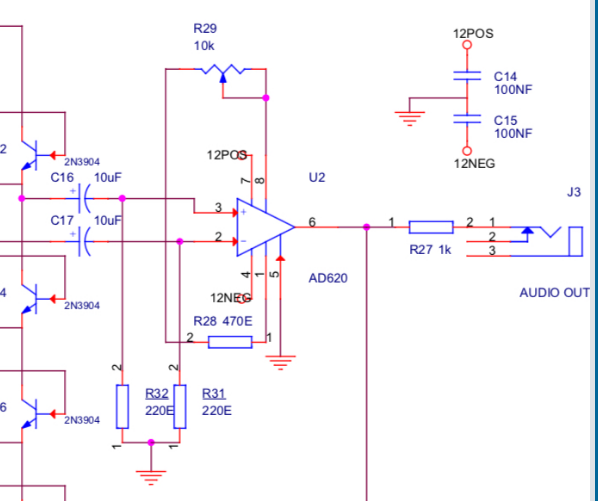 whats the blue signal in the right schematic? 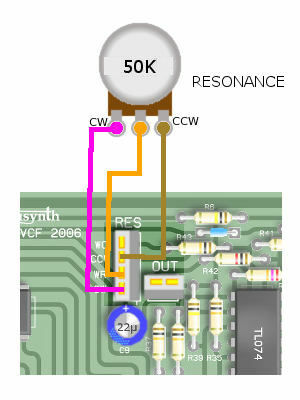 it took a signal from the wiper of the resonance pot and fed it to the output. ah, you mean add whatever comes out of the resonance pot and add it before the vca? thats simple indeed! maybe thats why the 303 sounds so overdriven if you crank the resonance. so whats the function of this dual gang pot? guest is a lot more knowledgeable by me, I'm mostly here out of curiosity. Here are some of my thoughts though. In my head, I've come up with a couple of ideas on how this circuit might be working, but I just want to be clear that I'm not too knowledgeable and could likely be wrong. This is more of an educated guess than anything. If you take a look at the pb4 dual gang pot in the 4072 schematics (the upper wiper). That is the one that is responsible for the gain compensation. When the wiper is all the way to the left, or in other words the pot is turned fully CCW, the wiper is connected to gnd, and then through R43 to the inverting input on U2B pin 6. I'd imagine that since that op-amp is referencing gnd on the non-inverting input, having the R43 connected to gnd in this scenario would reduce the gain since gnd through R43 is already helping both inputs on the op-amp remain at gnd. I'm not 100% sure if this is the case though. Another way I could see this circuit working is that as the potentiometer is turned fully CW, the resistance in the series branch of C9 and R43 is decreased, allowing more signal to pass through to U2B pin 6, increasing the gain. Actually, now that I look at it, this seems much more likely than the other speculation I made. i think the dual gang pot is doing the exact same thing, but with more components. if the two pots had different tapers you might be able to get a better volume control, maybe? HERE is my mod of the transistor ladder filter. I have this ^^ replaced by an instrumentation amplifier. this is a good mod, as it eliminates the gain loss at low CV. this is different from the OPs issue - here as you sweep the filter frequency down, the gain drops a bit, which is particularly noticable at higher resonance, as the resonance feedback drops. you can replace R31,38 with 1M to get most of the way there. the output impedance of the ladder filter is around 250k at the low end, so you just need to be much bigger than that. and, if you want a 2 pole filter, you can place another instrumentation amp at a lower point on the filter. There’s this version as well... with gain compensation, separate pole outputs and even voltage controlled resonance. I want to give it a try someday. Maybe you can use my solution for inspiration. I have added an adjustable gain loss compensation for high Q to my take on the Moog Ladder . And brought out the 6dB, 12dB and 18dB poles on an additional board as well. so i think i will go for the 303 gain compensation, do you have a schematic for that? The signal from the ladder is weak. So, you need to keep the wires as short as possible or you run in all sorts of trouble. This means your additional circuitry must fit in the the Behringer case. And don't forget you need to power your additions. Easiest done from the internal PSU. There was no "real" need for a single chip instrumentation amplifier, I could also have made an instrumentation amplifier with a quad opamp like the LM324 although with less good results in terms of noise, DC behavior etc. That's what i used for my additional board with good results. "... but I added a “Q Compensation” control. The negative feedback resonance path in the 1100, like the Moog 904A, caused the amplitude of signals in the passband to be attenuated as the Q increased, which some users found undesirable. If instead the signal is inserted into the Q VCA, this effect is eliminated. 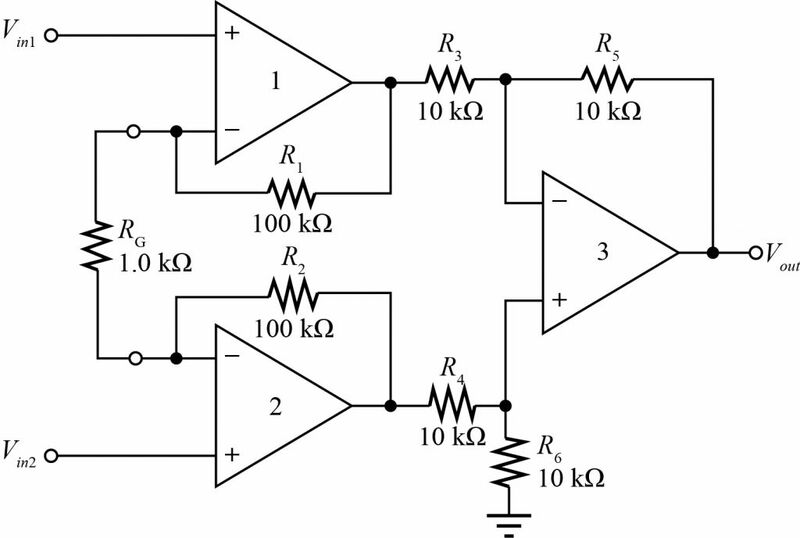 In EVOLUTION, the Q Compensation control allows insertion of the signal with an arbitrary mix into either of these inputs, allowing the ratio of direct to resonant amplitude to be arbitrarily selected." im going to try this. by "output" you mean the output signal of the filter before it goes into the vca? to be sure, where in the schematic would you insert the resonance signal? lets keep this as simple as possible, all of this or which parts? dave rossums evolution ladder filter has amazing functionality and part of the inspiration for all this. alas, the minimoog doesnt have a resonance vca so i cant do this i think. here you can hear how great this filter sounds compared to the moog way of doing it. i like especially the 1/2 pole sounds and feel master moog has robbed us of half of the goodness of the ladder filter. you listen to this and all you really need for awesome synth sounds is that filter with all its possibilities and ONE vco with a suboscillator - just as good as a sh-101, to me. carefull! R32,31 = 100k and C16,17 are shorted! also: this part is just an amplifier, it does not filter in any way! 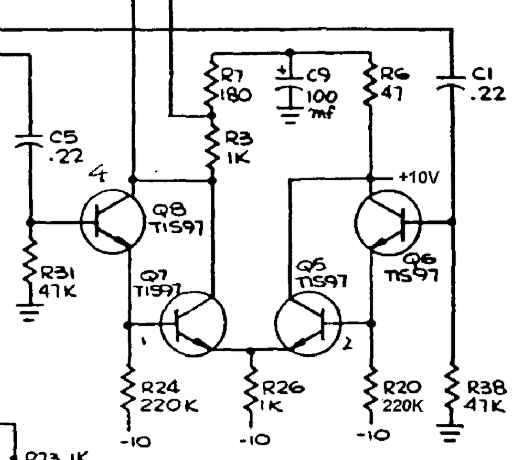 yes i know ... thats what i would graft onto the minimoog filter circuit, in addition to whats already there ... see schematic in my first post. 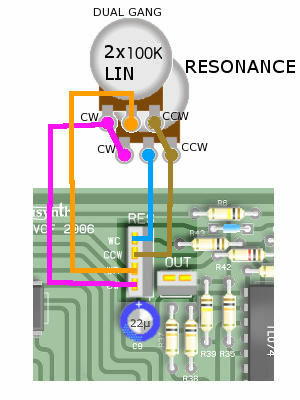 you will want to make a small buffer amplifier, and connect it to the wiper of the resonance pot. a gain of 10 or so should be fine on this amp. then connect the output of that amp with a resistor and capacitor to the VCA input (Q16 on the original). this will run in parallel to the resistor and capacitor that the filter output use. For those who missed the conversation a couple of years back about the Emu low pass filter. that schematic is the old emu filter from the 70s. i now took a closer look at the new evolution filter and it mysteriously has 3/4/5/6 poles but no 1/2. who on earth needs a 36 db filter but no 12 db? and a 6 db filter is amazing for pad movements while a 36 db filter is pretty much useless, thats why nobody is using these in synths. kinda scary how much the level drops at 6db and 12db - so a booster circuit as decribed by haraldswerk might be a greta boon here!